From the outset, I want to be clear: I was quite giddy about this flight. I got even more excited when I boarded. And the flight was great compared to most every other flight I’ve taken – but. There is always a but. As my wife or my friend Saianel would say: I can be a diva sometimes. Perhaps it’s ironic that I was watching a Sir Elton John concert on In Flight Entertainment (IFE) as I wrote my notes (over breakfast, still on the A380). Boarding the flight was marvelous-and I don’t use that word lightly- it was amazing to board the plane, and be shown to the largest seat/suite/apartment in the sky that I’ve ever had. In fact, I found myself standing through most of boarding, because it was so roomy. There was so much to explore, and, maybe even get a peak at the Residence. Of course one of my first questions was if there was a Residence passenger-there wasn’t. But it was kept closed the entire flight. That’s ok though- I totally get that they want to keep it fresh. 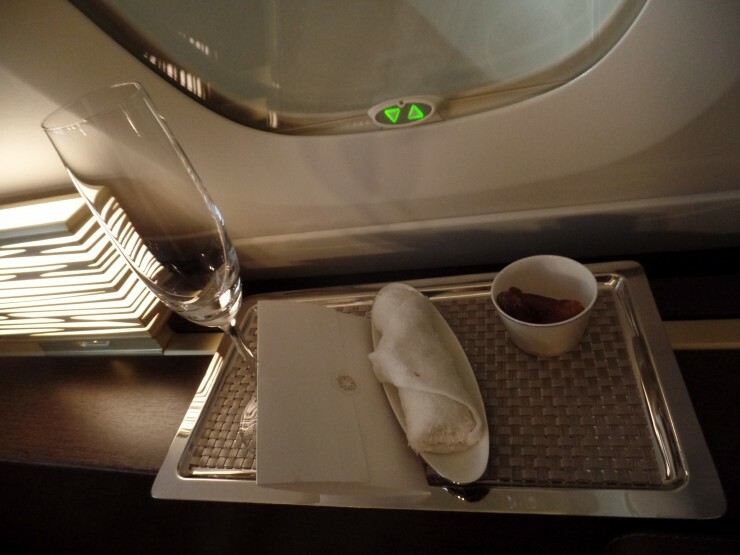 Boarding consisted of three or so glasses of Bollinger Champagne-certainly a favorite, much more so than Krug. 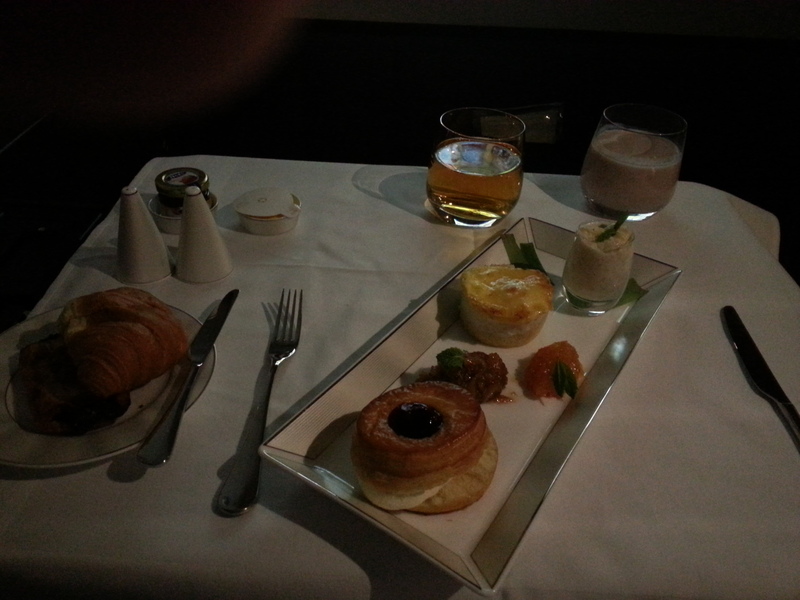 Enrico, our onboard chef informed us that Etihad had just changed the champagne the day before. Now *that* is a change I like! The amenity kit was in the powder/make up area, with the different things taken out and put into a variety of slots. It just so happened that I ended up in my wife’s seat, and she in mine. The three glasses of Bollinger meant it took a moment for me to realize the differences–they are kind’ve subtle after all. For the purists that like to save their amenity kits in the plastic wrap, this might’ve been a problem. 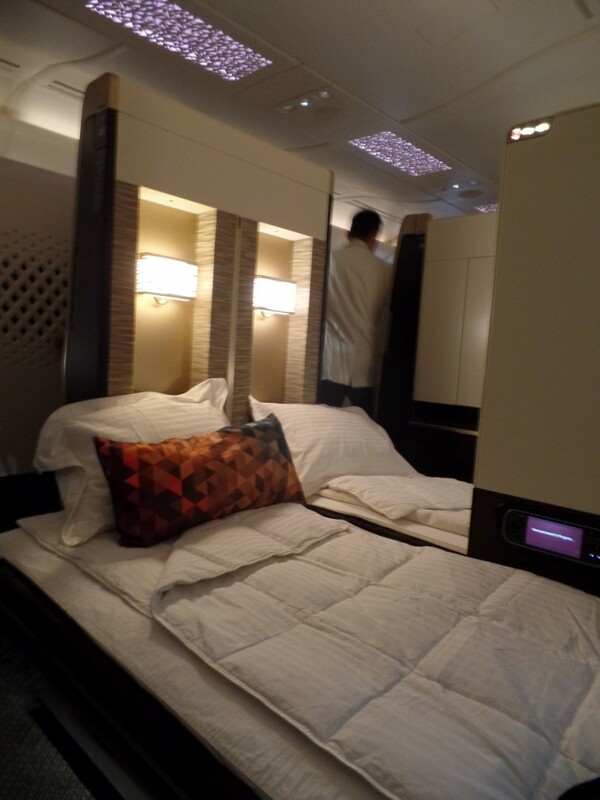 We were provided pajamas-I’ll note that they were different from the PJs I got even last month flying an A340. 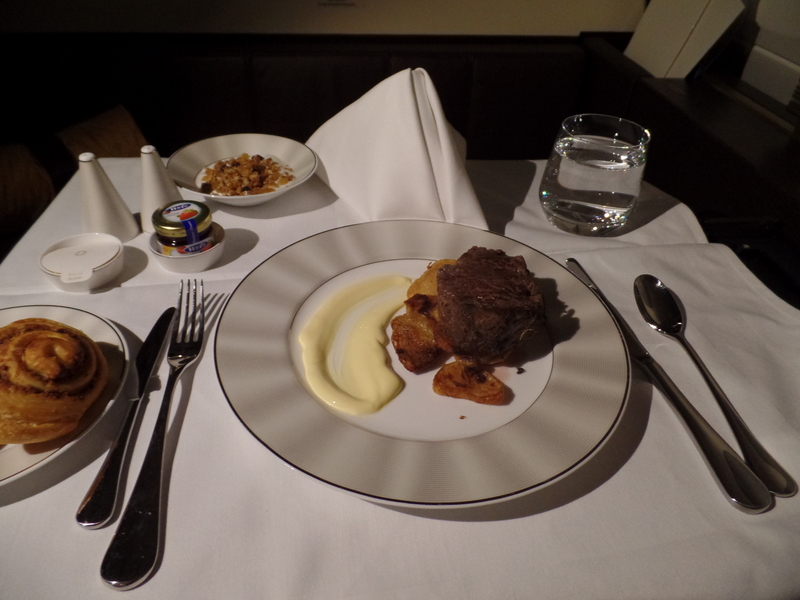 I provided my order for the flight to Enrico, it consisted of a grass fed beef tenderloin after take off, and a breakfast taster before landing. After a few short minutes my wife and I decided we should check out the “lobby,” en route we chatted with the Cabin Manager and the Cabin Butler-Roberto. The Cabin Manager-his name escapes me-was only on his first or second flight. 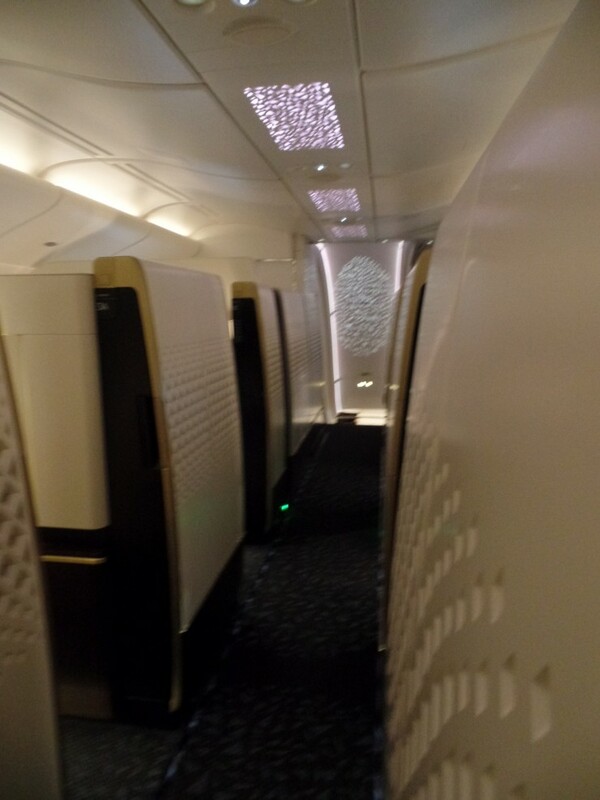 He was specifically on board to test some improvements for the day flight back to Abu Dhabi. We chatted for a bit, then he excused himself, no sooner did Enrico join us, where we offered some suggested places to visit in Washington, DC, which ironically he would be in a few short weeks, and I ended up running into him and Roberto, at Aviation 15. He also offered some suggested places to visit in Italy-his native country. A word about the Lobby: I’ve got to say, while the concept sounds cool, it really was wasted space. It just wasn’t clear what the point was. 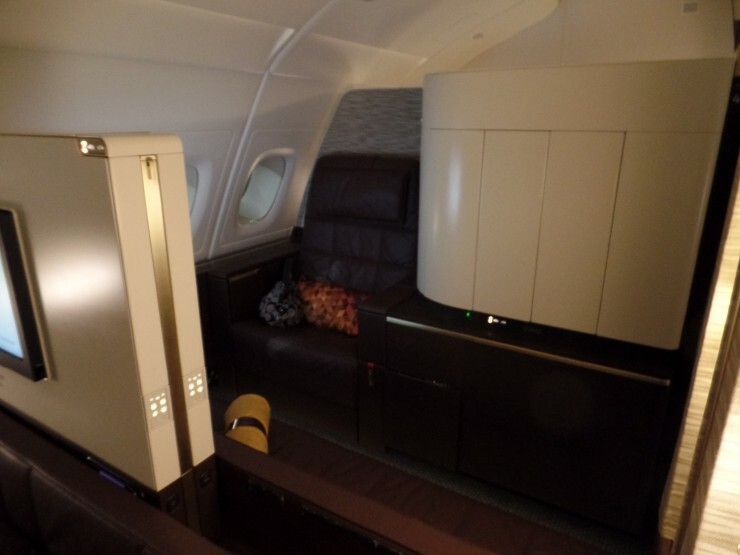 Yes there were some board games, like chess, but, I didn’t get the kind’ve feeling that I’ve gotten from some of the onboard bars, like Emirates’ or Korean’s A380. Before long-since this was only a 7 hour flight- we excused ourselves to grab some shuteye. We were seated in 3K and 4K, which had the partition, which was stowed to let my wife and I see each other while we rested. It’s not a full double bed like Singapore Airlines but its still nice. 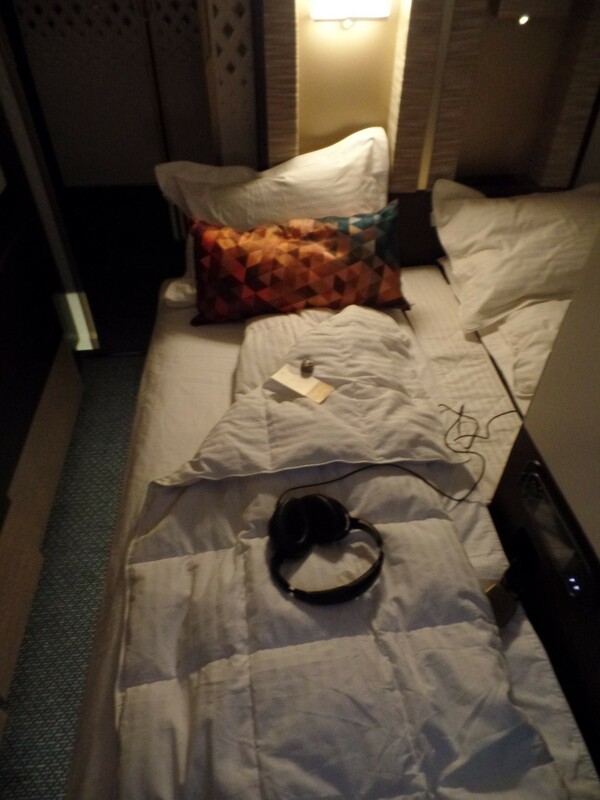 Beds made prior to takeoff. Normally I sleep better in the air than I do on the ground. This was different. Because the bed is sideways to motion, it feels different. We had a good bit of turbulence, and I found myself waking up throughout the flight because of it. Normally, turbulence would just put me into a deeper sleep. My wife snuck in her shower request before me, so I “opted” to take my shower about two hours before arrival. 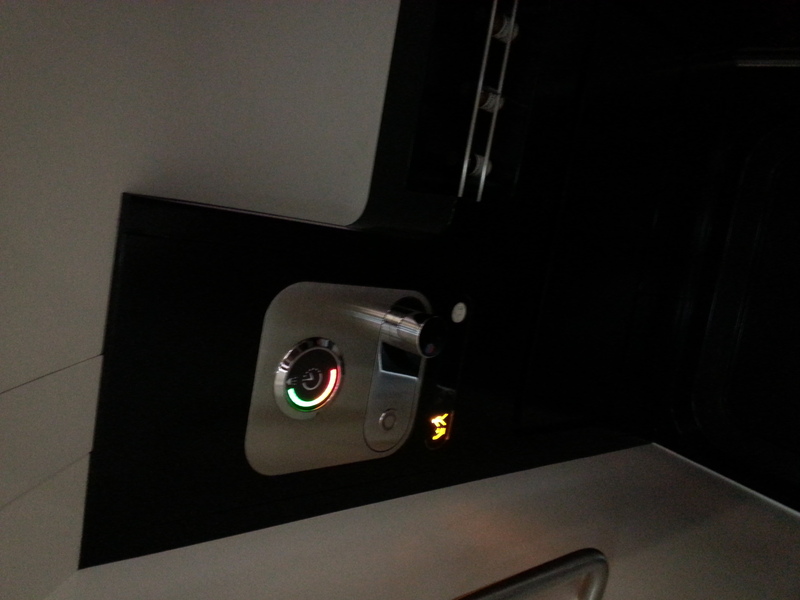 Shortly after I woke up from the turbulence, it was time to take my shower. The shower room–by my perception–is the smaller of the two lavatories in the cabin. It felt very tight. 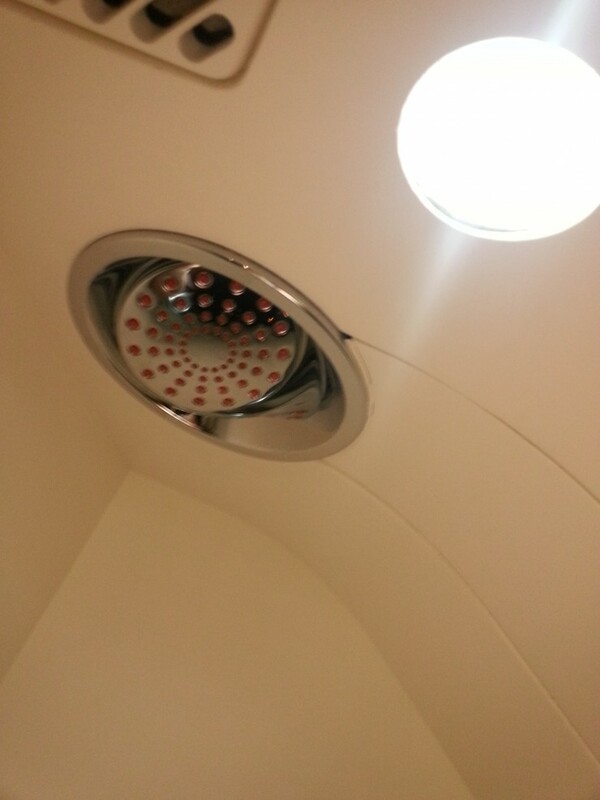 I know, I shouldn’t complain, I’m showering at 40,000 feet after all. But as a man of 6’2″, and about 200 pounds, it was close quarters. Add to that, the actual shower area was quite slippery. I stepped in having an idea it might be, thanks to Lucky’s post. That said, I had a hand on the safety bar for probably half the shower. It didn’t help that we had turbulence the entire time-but luckily I didn’t need to return to my seat. Overall though, I have to say, I was not impressed with the shower. 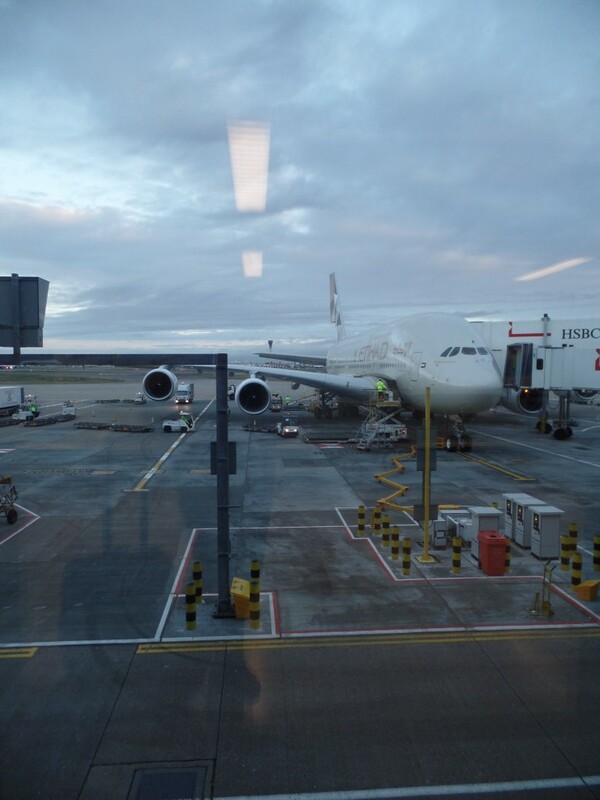 At first I thought that maybe the novelty was wearing off, but I sure enjoyed my two showers on the Emirates A380’s a few days later. After my shower, I enjoyed a small breakfast taster. The headphone connection is magnetic. While that is cool, it proved to be a bit of a nuisance, anytime I moved around I’d knock it out pretty easily. 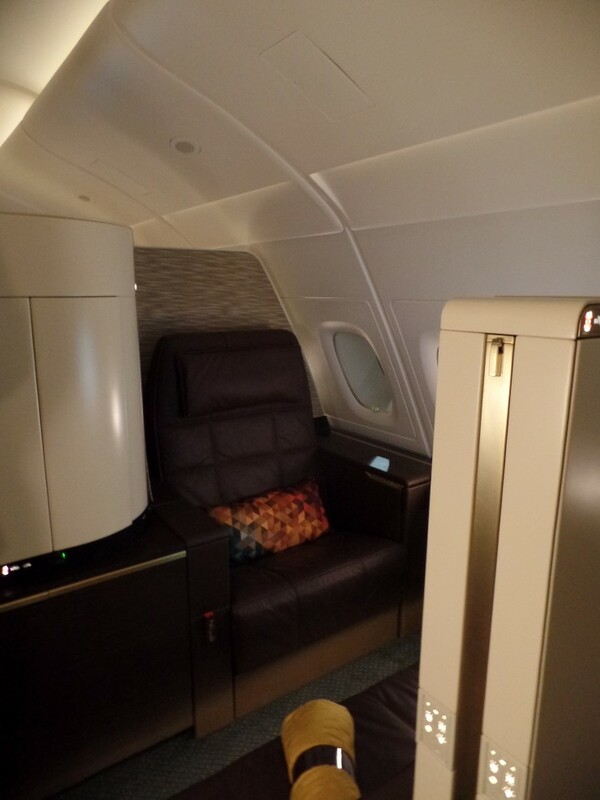 The service, despite having 4 cabin staff for 9 people, was also a bit lackluster, I did use the flight attendant call button at least a few times. 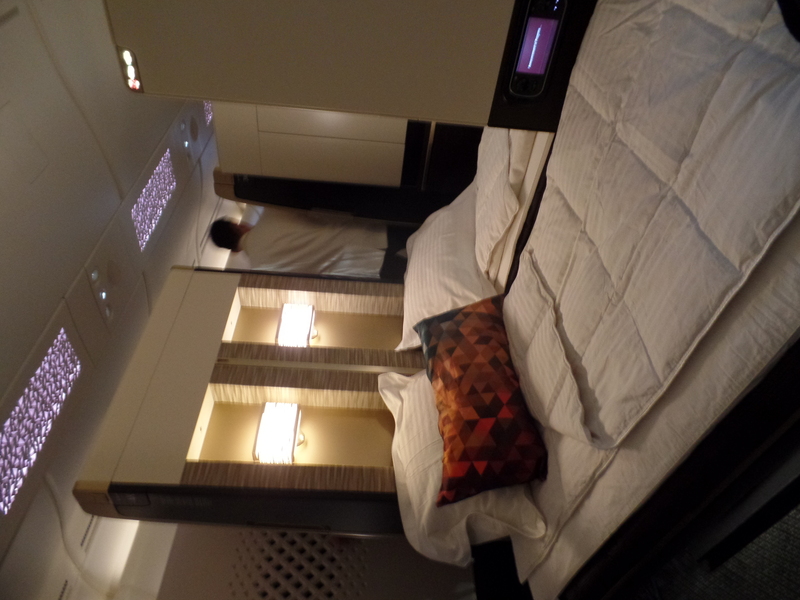 Etihad definitely did amazing things with the Apartment. 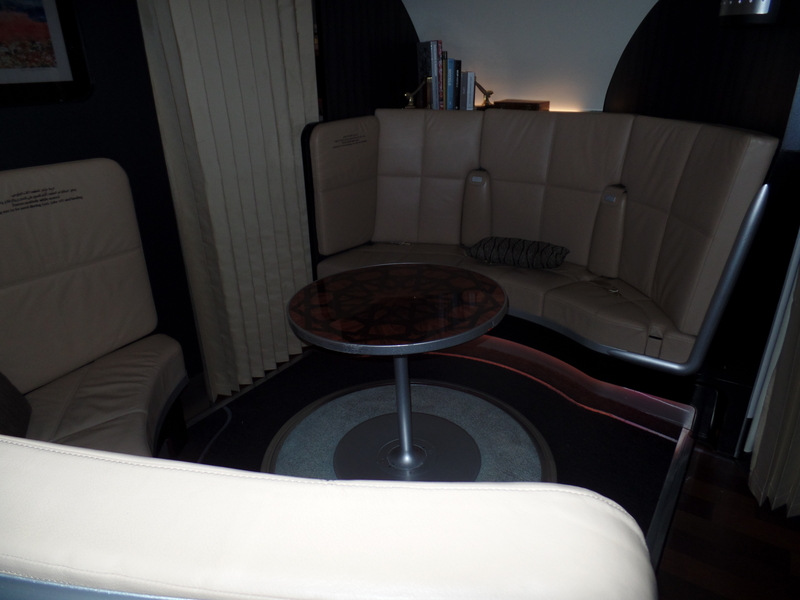 I really enjoyed the seat itself, but found some of the other aspects of the Etihad A380 to be confusing. 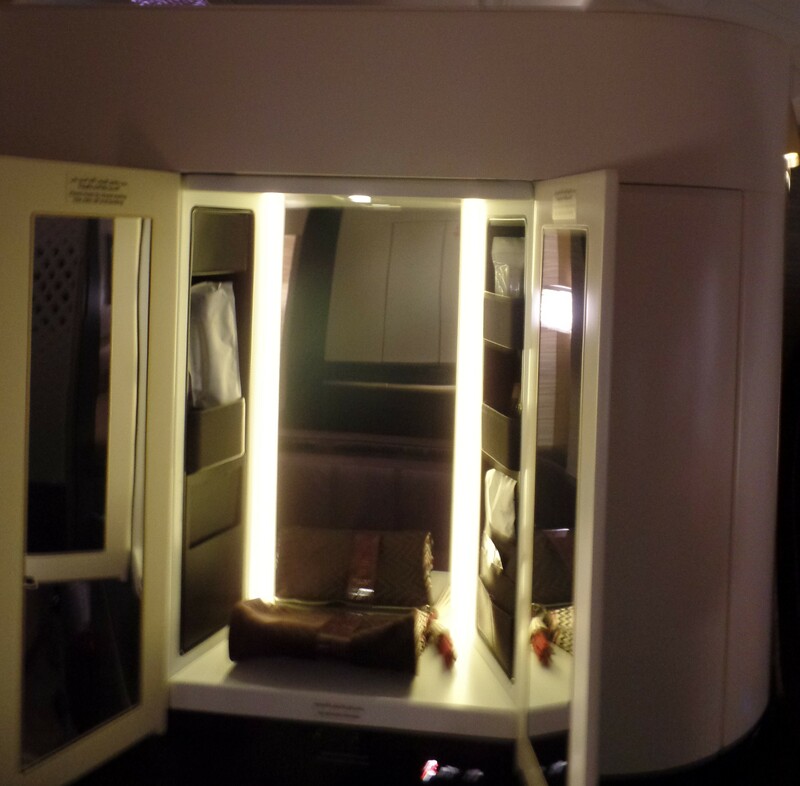 Clearly, Emirates’ Shower spa and onboard bar work. 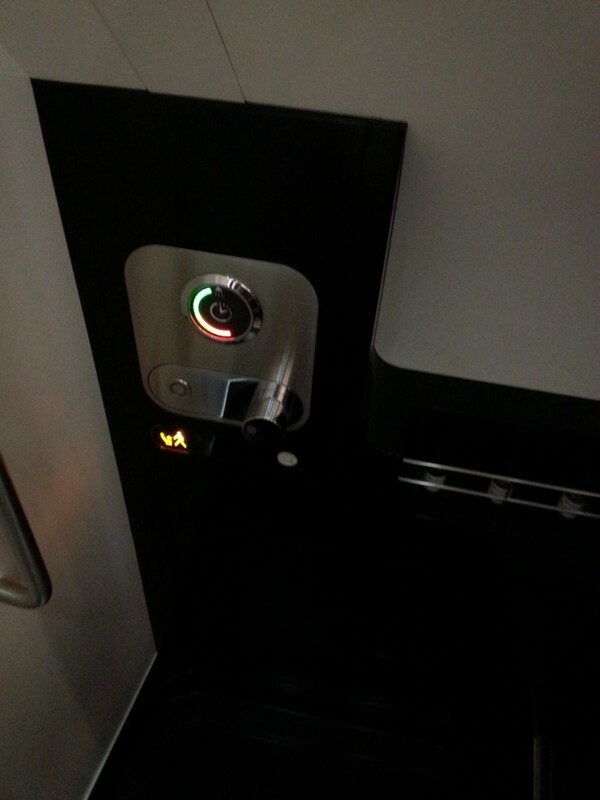 I kind’ve look at Etihad’s shower/lav and the Lobby as if Etihad broke what didn’t need fixing. That said, I’m currently scheduled to fly the Etihad A380 on a longer flight, from Sydney later this year, and despite my criticisms here, I am still quite looking forward to it. Nice trip report. I’m looking forward to my flight now.